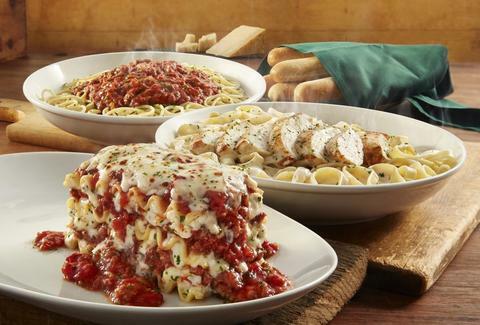 Popular opinion on Olive Garden is, shall we say, divided: On one side are those who think the restaurant overpriced and faux-Italian; on the other are those who name their daughters in honor of the casual-dining chain. For instance, Justin and Jordan Garton of Arkansas, who will be naming their first child Olivia Garton in homage to the purveyor of bread sticks. The couple has a pretty endearing relationship with the restaurant. Justin, 28, and Jordan, 26, grew up going to Olive Garden, and in 2015, not long after they were married, the couple nabbed a coveted Never Ending Pasta Pass and ate at the Italian chain for nearly seven weeks straight. The pass is $100 and blesses the cardholder with unlimited bowls of pasta, salad, soup, and breadsticks. “I just love Italian food and growing up in Arkansas that’s pretty much one of the only Italian places that we ever got to go,” Jordan Garton told ABC News. The couple knew they wanted to give their daughter a name with Italian origins, but they thought Olive Garton would be a little on the nose and worried it would lead to other kids bullying her. Olivia immediately presented itself as the right choice. “We were able to make the joke, but a little more subtle, and it’s still a pretty name,” Garton said, per the report. “It was definitely an easy decision." Justin Garton tweeted a picture of a onesie -- a gift from friends -- that played on the restaurant's logo. Olive Garden saw, and now there's a "little surprise" on the way to the Gartons. The restaurant will also send food and gifts when Olivia arrives -- just like the three wisemen. In what they also insist is a coincidence and part of a tradition of using a sibling's name as the baby's middle name, her full name will be Olivia Michelle Garton, initials OMG. James Chrisman is a News Writer at Thrillist who went to Oliver Garden before the Homecoming dance many moons ago. Send news tips to news@thrillist.com and follow him on Twitter @james_chrisman2.